Zorbing (globe-riding, sphereing, orbing) is the recreation or sport of rolling downhill inside an orb, generally made of transparent plastic. 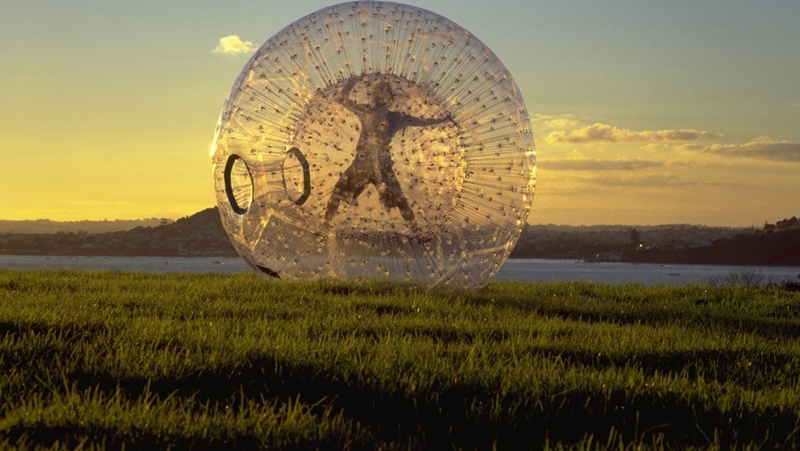 Zorbing is generally performed on a gentle slope, but can also be done on a level surface in pubs and clubs around the UK, permitting more rider control. In the absence of hills some operators have constructed inflatable, wooden or metal ramps. Due to the buoyant nature of the orbs, Zorbing can also be carried out on water, provided the orb is inflated properly and sealed once the rider is inside. 'Water walking' using such orbs has become popular in theme parks across the UK. There are two types of orbs, harnessed and non-harnessed. Non-harness orbs carry up to three riders, while the harness orbs are constructed for one to two riders. Double-harness spheres have different slope requirements, and must only be operated in specific locations. The longer runs are approximately half a mile. The first zorbing site was established in Rotorua, New Zealand, by David and Andrew Akers In the early 1980s, the Dangerous Sports Club constructed a giant sphere (reportedly 23 metres or 75 feet across) with a gimbal arrangement supporting two deck chairs inside. This device was eventually cut up for scrap, with some of the plastic remnants used to cover a compost heap. Human spheres have been depicted in mass media since 1990 when the Gladiators event "Atlaspheres" first aired, albeit with steel balls. Sphereing is also referred to as Orbing or Zorbing, and Zorbing entered the Concise Oxford English Dictionary in 2001 where it was defined as: "a sport in which a participant is secured inside an inner capsule in a large, transparent ball which is then rolled along the ground or down hills".